Well, Henry did indeed destroy Moloch. At least that how it appears, since the creature's demise lead to a host of demons (plus one renegade angel) breaking out of purgatory. Has the apocalypse truly been averted? What will our two witnesses do now? Will they reinvent themselves? 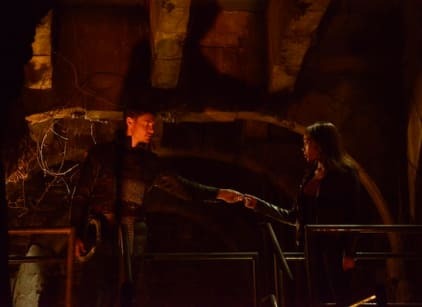 It doesn't take long for the angel, Orion, to make contact and inform Abbie and Ichabod that though one battle was won, the war is far from over. Elsewhere, Katrina feeling responsible for Abraham's predicament tells the Horseman of Death she believes she can lift his curse. Unfortunately, good ol' Headless' days are numbered if Orion has anything to say about it. The renegade angel plans to rid the Earth of all evil. Katrina refuses to allow the angel to kill Abraham, and sets the Horseman free. Needless to say, this makes her a target of Orion's as well. Crane informs Abbie that Orion was present at many of the world's greatest catastrophes. Did the angel have a hand in causing these events? Or is there more to the story? Meanwhile, Jenny and Hawley meet to discuss his demon tracking egg. Hawley can't help feel jealous watching Jenny flirt with the bartender. We soon learn this mysterious egg will be used to hunt down the demons that escaped from purgatory. Hawley cracks the stone shell open and finds the real enchanted egg hiding inside. He locates the demons and Horseman, then shares the details of his whereabouts with Abbie. Naively believing the angel to be good, Abbie tells Orion where to find the Horseman. He confesses he plans to cleanse the Earth and sentence mankind for its crimes. Abbie quickly realizes Crane was right, the angel is not who he seemed. The duo arrive in time to find Orion and the Horseman locked in an intense battle. Abbie distracts the renegade angel while Ichabod destroys Orion's weapon effectively saving Abraham's life. The Horseman is indebted to Crane and plays nice for the time being. Orion flies off, defeated for now. However, Abbie still has the halo keyring he gave her in case she ever needs his assistance. Captain Irving wanders into a small convenience store and begins to drink milk and eat. How exactly did he survive? Is he even human anymore?